Is it hair buns or odango? I really don’t know. At any rate, we all know that hair buns are always delicious to see. I mean delightful. Or do I actually mean delicious…? It’s all true, by the way. Drawn by Ibuki. Well, without further ado here is my list of my favourite characters with odango (or is it hair buns? I’ll never know at this rate)! I remember admiring Mei’s multi-part hairstyle as a middle school kid and staring at the pages (she’s down this low since my experiences with her align more with manga) for hours. Her buns are not like the typical hair buns, I know. In my mind, however, Mei counts. But wow, talk about an overshadowed character. We never really got to see Mei’s true strength in Mahou Sensei Negima! since she only got to seriously fight twice in the (manga) series: once early on against the main character’s rival in a tournament setting (the odds were really against her) and once against the main character and his students (the odds were really, really, really against her). With that being said, Mei is also a talented mage and was actually able to stop some of Negi’s students, but in the end she was overwhelmed to no one’s surprise. By the way, she isn’t a villain because she fought the main character, Negi. There was a huge misunderstanding and a very messy time travel situation going on, alright? 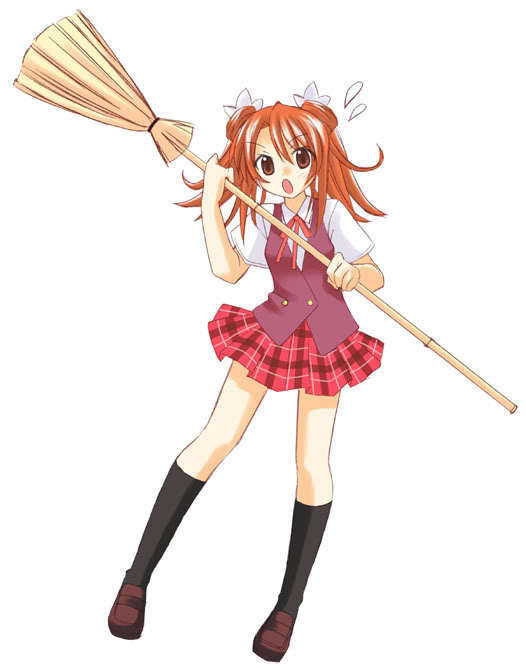 Mei also appears in Love Hina as Naru’s stepsister but with a different last name. Her role in the anime is much bigger compared to that of the manga (in which she only appears in the very last chapter) and she’s sort of nosy and a bit of a cry-baby. But ultimately Mei means well and encourages Keitaro to get together with Naru. There were plenty of misunderstandings in that particular arc, too, now that I think about it. Maybe it’s just something to be associated with Mei. The fact that Mei’s pactio partner is Takane gives me life since pactio pacts are typically formed by mouth-to-mouth kisses. No girl gets away with throwing shade at my Kero-chan! Unless if it’s you, Meiling. I hated Meiling so much in the earlier episodes of Cardcaptor Sakura. What a cocky, rude girl she was! With that being said, I didn’t fail to notice that she gradually started being nice to Sakura. I mean, she let Sakura eat some of her food. That’s a big deal in my book. I don’t let you touch my grub unless if I like you. And through splendid character development Meiling ended up being this great, complex character who gracefully accepts that the boy she loves is drawn to someone else. Some adults struggle with that. But Meiling won me over with her classy conduct as an elementary school student. Please show her some respect, people. She also has this alarmingly aggressive ohohoho laugh. Listen and be amazed! Finally she’s a great cook when she’s not trying to rush through and hastily bake a cake. She taught me that my family has been making dumplings / jiaozi wrong this entire time in the latest Clear Card episode. My mind is blown! Shown above: Master Chef Li Meiling teaching us how to make delicious dumplings. Love the way you tie (your scarf). Quiet, snarky girl who isn’t afraid to do things by herself? And a girl who still knows when to get excited despite the fact that she seemingly has a really melancholic face? Nadeshiko’s cheerfulness is charming in its own way, but Rin was definitely best girl in a decent series. Shimarin is so cool that she developed her own group of fangirls! Just kidding. Ah, Akarin is so pitiful. And that’s what makes her great. Just look at all the cool tricks she can do with her hair buns! Not everyone can do that! See, Akarin’s cool, right? Right? Tsushima Yoshiko – Love Live! Sunshine!! Ah, wait, Yoshiko’s glorious hair bun / odango is partially obscured. Consult this link if you wish to know more. This post is good as a secondary source, too. I guess if I had to add a reason that wasn’t mentioned earlier, Yoshiko’s crying face and pouty voice is a winning combination! That’s all from me, folks. Did I miss any great characters who regularly wear spherical buns as part of their hairstyle? Let me know in the comments section! Meiling and Yoshiko were absolute musts for this hairstyle. As usual, you didn’t disappoint. Haven’t seen any of the other three, though I would’ve watched Yuru Camp if I’d had time to watch any seasonal shows this winter. A few others that might make my list are Yui from Oregairu, Saber from the Fate franchise, and Naka, my favorite ship girl from KanColle. Oohh I’m glad we’re in agreement there. They HAVE to be on this list! Mmm it really does seem like you had a very busy winter. My condolences (and my gratitude). Those are all definitely worthy contenders for best hair buns. Great picks! Yay, another fan of Mei! Oh, that’s neat! Which character was on the scroll art? No problem~ there’s already a lot of defenders of Sailor Moon’s hair buns so I figured I could leave it to them (plus it would have been weird to include a show that I only watched as a kid and thus can’t remember anything). I saw the blog on Twitter just a second ago and immediately clicked through just to reassure myself Yoshiko is number 1 for you. If she wasn’t, I was going to call the police and report that you’re being held captive and forced to write against your will – because that’s clearly the only way how that would happen. You know me too well, Prattle. I’m glad you’re looking out for my safety and for potential signs that would show I’m in distress, haha. IIRC, “hair bun” refers to the singular and “odango” to the plural… But I’ve never actually seen “odango” used in the wild other than as a slur by Darien against Usagi. Ohhh, I see. Interesting. Thanks! Hmmm they did refer to Shimarin’s hair bun as dango in Yuru Camp. Praise the great bias lord! Pls, I’m fair and honest.